If you have children of a certain age you'll no doubt be familiar with Andy Day from CBeebies. You've probably seen him having dinosaur adventures, or presenting from the CBeebies House. But did you know he can sing?! 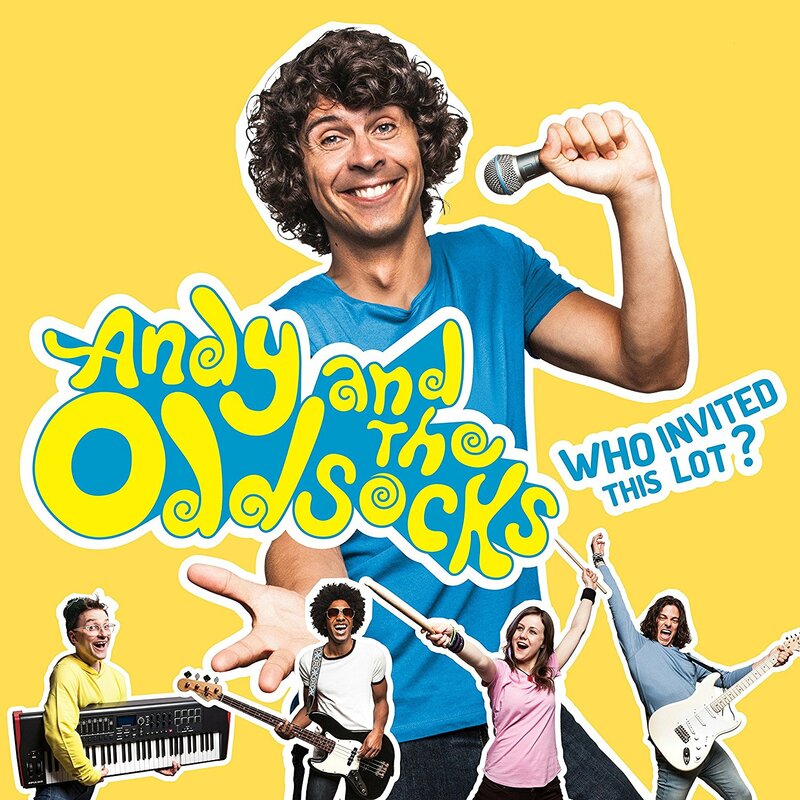 Andy and his band, the Odd Socks are due to release their debut album next month and this week they played a series of gigs in London and Nottingham to kick off their album launch. The tickets were like gold dust but we managed to snap some up the minute they went on sale...phew! The album "Who Invited This Lot?" is actually a rerelease, we picked up a copy back in 2015 and it has been in our car on repeat ever since. However, Andy has since been joined by his amazingly talented Odd Socks band and the track listing has had a bit of a tweak. There's Moxy on drums, Rio on guitar, Blu on bass and the especially bonkers Random Keith on keys. This time round they mean business! 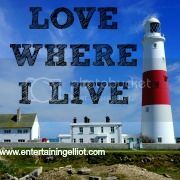 We left Dorset nice and early, picking up my Mum along the way and after a couple of wee breaks, several snacks, a magazine bribery and of course, some singing to the Odd Socks we arrived in Richmond and couldn't wait for the show. Elliot had been asking me "Is it time to see Andy yet?" from around 630am so you could say he was getting excited! Soon it was time to take our seats, and the advantage of arriving nice and early meant we had the best seats in the house. Slap bang in the middle of the front row, we almost felt like we were part of the show! Before the show started, the band came out and were interacting with the crowd - Random Keith was checking for odd socks and fortunately Elliot wasn't wearing a matching pair! 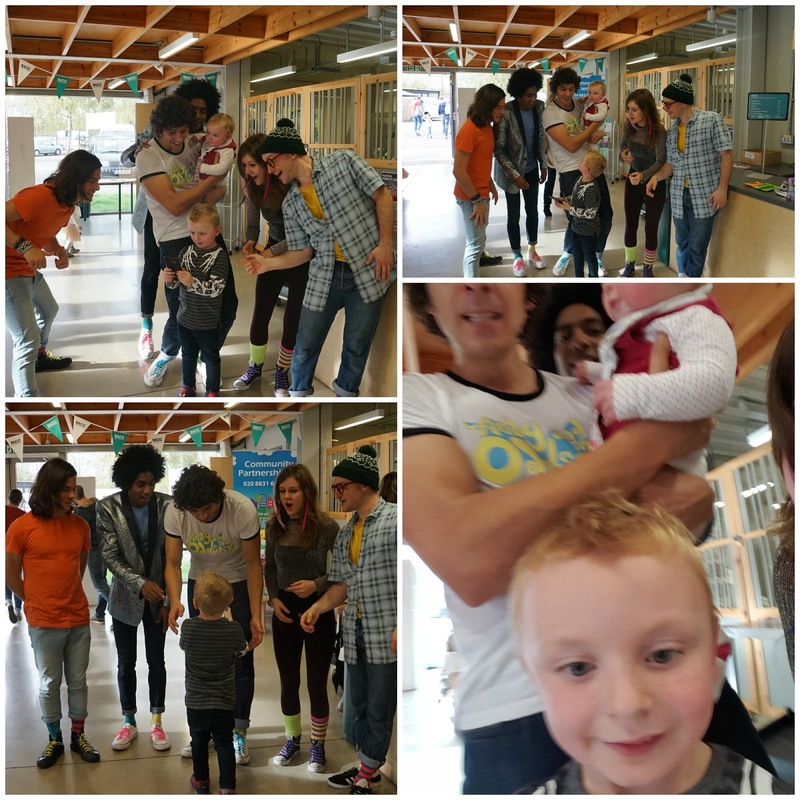 The band are all very talented but they are also really great with the children, taking time to chat and answer questions. Running through songs such as Unique, Battle Robot Rapper, Groovy Hoover, Ninja Pig and Elliot's fave, the Dinosaur Football Legend Mega Match , every song was a hit with the audience. Just like at Camp Bestival, the Dinosaur song came with big footballs that were bouncing around the crowd but this time round, there was even a dinosaur! I'm not sure it was intentional but Random Keith who was in the costume, fell over and popped his head up from the dinosaur's middle...it looked a bit like the dino was giving birth to Keith, very funny! We were even treated to a rendition of Ghostbusters, one of the new songs to be on the album and just in time for Halloween. The band came out in the their Ghostbuster costumes and the kids loved it, I certainly loved having a singalong! Before we knew it, the show was over but not before a quick encore of Aliens..complete with little green men! 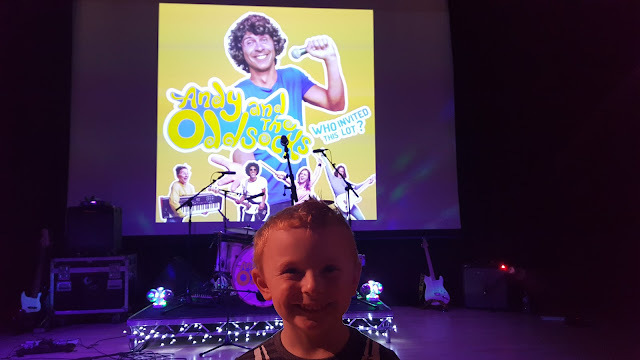 After the show, we queued up to meet Andy and the band and Elliot said he wanted to get a selfie. I wasn't sure how successful that was going to be so I loitered behind with my camera!! Elliot was pleased when Andy said "This is Elliot, he's been to all our shows!" and it made his day when the band said they'd seen him on YouTube. They were all so sweet to him and he has been talking about ever since! 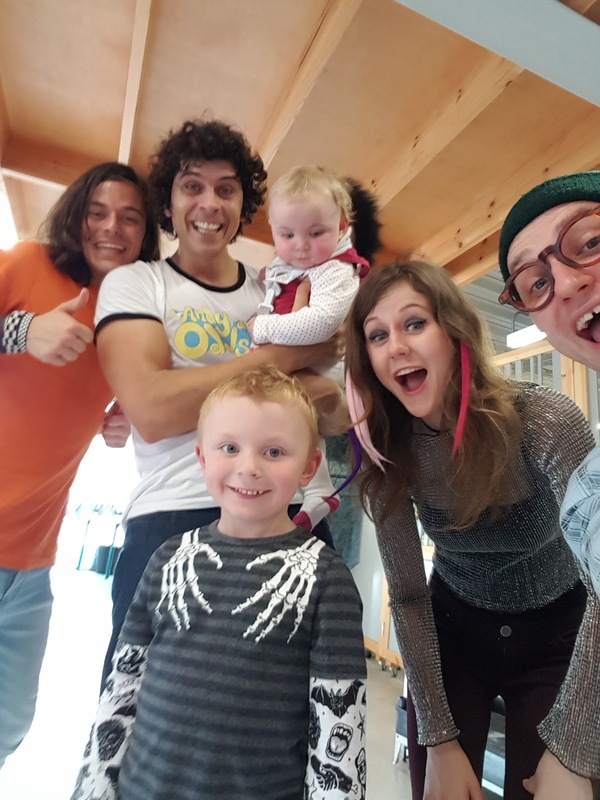 Elliot did indeed attempt a selfie but his arms weren't quite long enough so Random Keith had to step in and help and we got a brilliant photo. Erin even got in it too although my mum handed her to Andy and he wondered whose baby she was!! Sorry Blu, Erin has blocked your face! 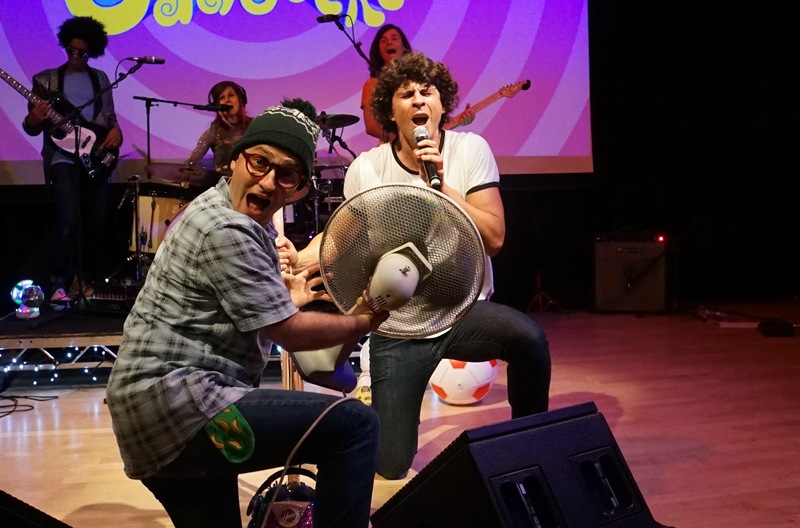 Andy and The Odd Socks say they are the greatest children's band ever (according to their mums!) and we would definitely agree. We had a brilliant time at the show and can't wait for the next one!